Last week we said there were hundreds of ways to remove backgrounds in Photoshop, and now we’re diving deeper into that claim. 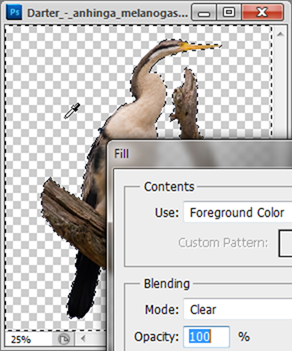 Keep reading for the next huge installment of ways to remove backgrounds in Photoshop! 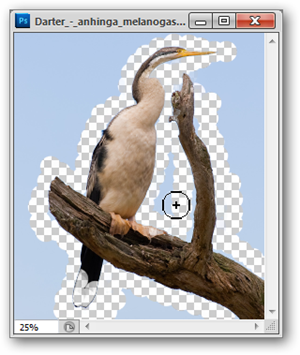 Today, we’ll cover masking images, and why some people prefer masking to erasing big chunks of your images, as well as a bunch of basic (and some not so basic) ways to remove all those image backgrounds using masks image erasing methods. Masking Images, Deleting Them… What’s the Difference? 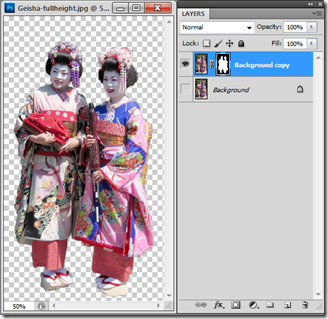 Last week, we covered the difference between unlocking an image background and duplicating it. Now, let’s take a look at the differences between masking and deleting, which aren’t apparent when you simply look at the images themselves. 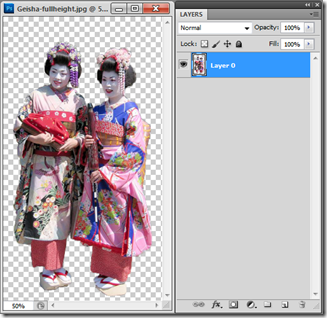 Layer Masks, which you can read more about here, are a simple way to hide information in layers while keeping maximum editability. Many professional Photoshop users often find a number of reasons they need to that hidden information, and Layer Masks allow them to keep it, while still hiding it away. 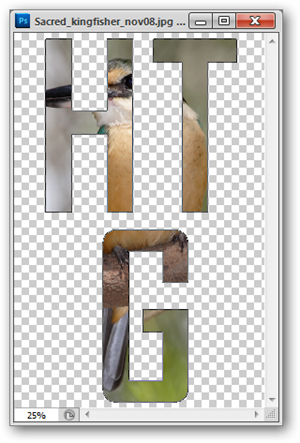 Create a layer mask by clicking the icon in the Layers Panel when you have a selection with the marquee, or any of the advanced methods located below. If your mask blocks off the wrong area, you can select the mask and press Ctrl + I to invert it, and switch the transparent and opaque areas. 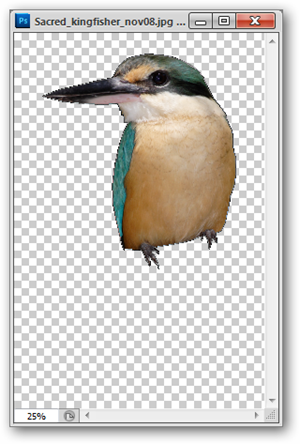 Layer Masks require unlocked layers, like the copy of the background layer above, or the “Layer 0” unlocked version of the Background located directly below. Refer to Part 1 to learn more about these two methods. There is, however, something to be said for deleting image information when cutting out background, some of which is not terribly useful to keep around. Many of Photoshop’s background erasing tools only work with the “image deletion method,” so it’s obvious to see there’s no right and wrong way sanctioned by Adobe. We’ll leave it up to the discretion of the reader which method suits them best, because Photoshop is all about the user’s options. Simply keep in mind that deleted information will never come back once it is deleted unless you can revert to an older version of your file. 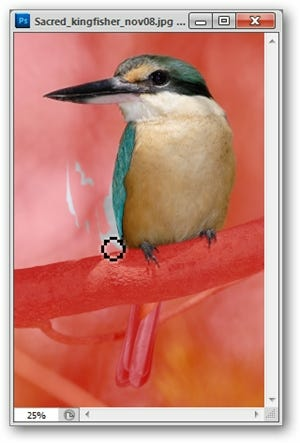 Erasing or deleting image information can be done on any layer that is unlocked, like the unlocked Layer 0 above, or the duplicated Background copy layer shown in the last example. The eraser works in manner similar to the brush tool and is simple enough to grasp and understand. Unlock your background layer like we showed you last week, and simply paint out the background information you don’t want to use. 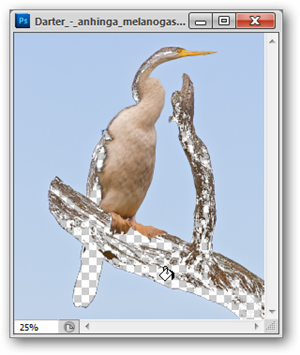 Many Photoshop users do not like using the Eraser tool to remove backgrounds, as it can be time consuming to accurately cut out an image, particularly for users that struggle to paint accurate marks with the mouse. The eraser is one of the most basic tools to remove backgrounds, and should be used as little as possible, if you can manage. Still, HTG has previously covered a more in depth how-to on the eraser tool. Buried beneath the ordinary eraser tool, you’ll find the simple-as-can-be Magic Eraser Tool. This tool is sort of like a Paint Bucket Tool that only fills transparency. There are lots of settings and methods to play around with the sensitivity of the Magic Eraser, allowing for lots of different results. One of the great benefits for new Photoshop users is that this tool actually will unlock background layers in a single step—simply click in a contiguous field of a single color in your “Background” layer, and watch it disappear to transparency. A more complete how-to on the Magic Eraser Tool can be found here. While this tool might seem like the holy grail of Photoshop tools, you’ll likely be let down when you put the Background Eraser Tool into actual practice. 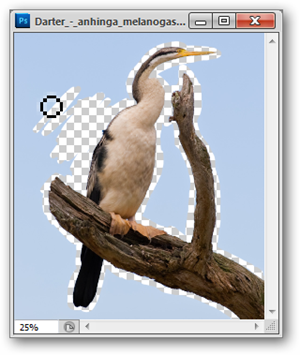 Using Photoshop’s edge detection, the Background Eraser tool is far from perfect. There are three settings: Contiguous, Non-Contiguous, and Edge-Detect. Frankly, all three have their inaccuracies, although one may have an advantage over others in certain situations. This tool is far from the best method on this list to remove a background. Experiment with it, but don’t expect to get a lot of use out of it. For some bizarre reason, Adobe has seen fit to give Photoshop users two tools with nearly identical functions. The Paint Bucket Tool has a setting that allows it to paint transparency,making the only difference that the Magic Eraser will unlock and paint to transparancy in one single step, and this tool will not even work unless the layer is unlocked. You can find the setting for “Clear” in the top options. Both the Paint Bucket Tool and the Magic Eraser have a special setting called “Contiguous.” Leaving this setting on means your fill will go to work on all enclosed shapes of that particular color. Turning it off will erase every instance of that color in that layer in the entire image. In cases where skies and random bits of backgrounds end up in enclosed parts of the image, this can be helpful, as it grabs all of it at once, reducing it to transparancy. It doesn’t discriminate between the parts of the image you want and those that you don’t, so use with care and be prepared to with a quick Ctrl + Z to undo goof ups. With a selection loaded on an unlocked layer, a simple press of the Delete or Backspace key can knock a layer down to transparency. It doesn’t get any simpler than that! A much under-utilized tool, the Edit > Fill tool is the superpowered version of the Paint Bucket Tool that works independent of the cursor. A quick tap of Shift + F5 will bring up the Fill dialog box, where you can fill all selected areas with preselected sets of colors, or simply fill said areas with transparancy. Because the Fill command is independent of the cursor tool, there is no way to control which colors will be knocked back to transparency, so make certain your selections are the way you want them before using the Fill tool. To knock back to transparency using this tool, set your “Blending Mode” to clear, as shown on the right. 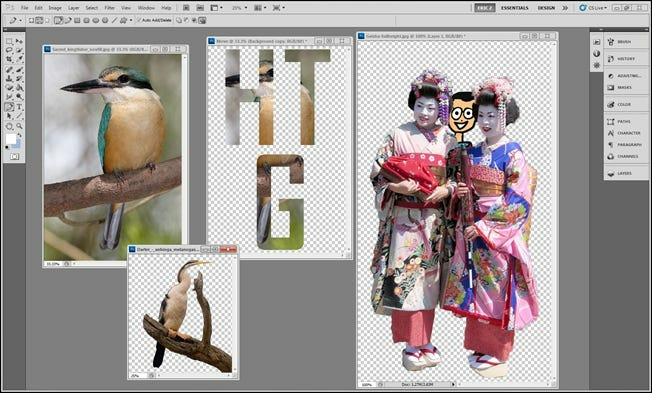 Press Q to jump to Photoshop’s Quick Mask mode, which allows you to create masks using the paintbrushes and buckets. The mask color is automatically transparent red, marking the color you’re masking out, or removing. In Quick Mask mode, you can use the Brush Tool, Pencil Tool, or Paint Bucket Tool to paint in solid colors. Since you’re technically working with a mask, you can only work with shades of gray, preferably black and white. In Quick Mask Mode, painting black represents masked or “erased” areas, while painting white represents your image areas. Press Q again to end quick mask mode, which will automatically create a selection from your painting. The pen tool is the go-to solution for many photo professionals that want to isolate an object quickly and easily. While the pen tool is notoriously difficult to master, skilled pen tool users can cut quite accurate selections in short periods of time. Using the pen tool, draw a vector shape around your object or objects. This can be tricky, as the pen tool is difficult. Once you finish your enclosed shape, you’ll need to find your Paths panel to load your selection. You’re looking for the button that looks like a Photoshop marquee that creates a selection for this path. You can also create a Vector mask from any path you’ve drawn. Instead of creating a raster selection from your vector drawing, you can navigate to Layer > Vector Mask > Current Path to automatically create a mask from your currently loaded path in your Paths panel. Vector Masks have the advantage of being scalable, and keeping edges clean even when artwork is blown up to large sizes. 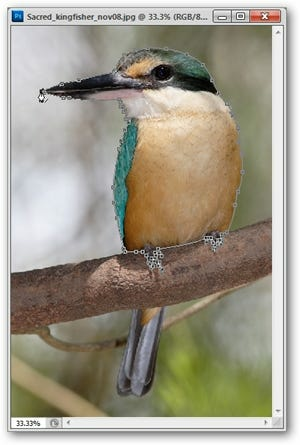 Beyond that, there’s little advantage of vector masks over Layer Masks, as vector masks seem to render masked images in a near-identical manner to raster-based Layer Masks. Simply use whichever mask style suits you best. For those of us that dislike using the pen tool, but like the advantages of vectors, there’s the Freeform Pen Tool. This tool allows you to draw line segments in the same freeform manner the Lasso tool allows. Simply click and drag to create vector paths to become selections or vector masks, exactly like the previous techniques. If you find you have broken line segments, you can simply switch to the Pen Tool to join them. One of the fun things about Photoshop, is that there’s rarely one single way to do things. In the case of vector masks, they’re not limited to paths drawn by the pen tool. Typography can also be used as a mask with this trick. Create some type of any size or typeface. Right click on your text and find “Create Work Path.” Photoshop creates vector lines around your text. From there you can return to Layer > Vector Mask > Current Layer to create a mask from your typography. Image Credits: Geisha Fullheight by Michael Reeve, available under Creative Commons. Darter – anhinga melanogaster and Sacred kingfisher by Fir0002, available under GNU License.